In 1947, with his reputation firmly established in Cairanne, Daniel Brusset’s father followed his vision to develop vineyards on Les-Hauts-de-Montmirail. 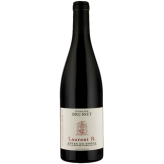 By 1971, when Gigondas was elevated from Côtes du Rhône Villages-Gigondas to its own AOC, Brusset was already one of the region’s best producers. The family had taken a risk and invested heavily in what they perceived as excellent rugged mountain land, ignored by neighbours who preferred easier, flatter terrain. Today Brusset is the owner of some of the most spectacular terraced vineyards in Gigondas, all on the formidable Dentelles, the sharp fingers of rock behind the village of Gigondas. Highly stressed vines, low yields, meticulous vinification and skillful use of some new oak produce wines of surprising quality and character.